In the English language, the word “as” can be used for a variety of purposes. 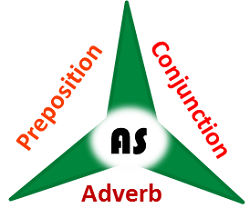 It can be used as a conjunction,preposition, or adverb depending on the context. The dolphins popped up as we passed by. Peter watched her as she walked through the crowd. They all felt as Dave did. I must prepare now as I have to go to school. Lisa had been stubborn as a teenager. a. used to refer to the function or character that someone or something has. She got a job as a saleslady. Marco had often been sick as a child. Her hair is as soft as silk. The word is used to compare the noun “hair” with the noun “silk” in terms of the softness. The sinkhole is as big as a basketball court.